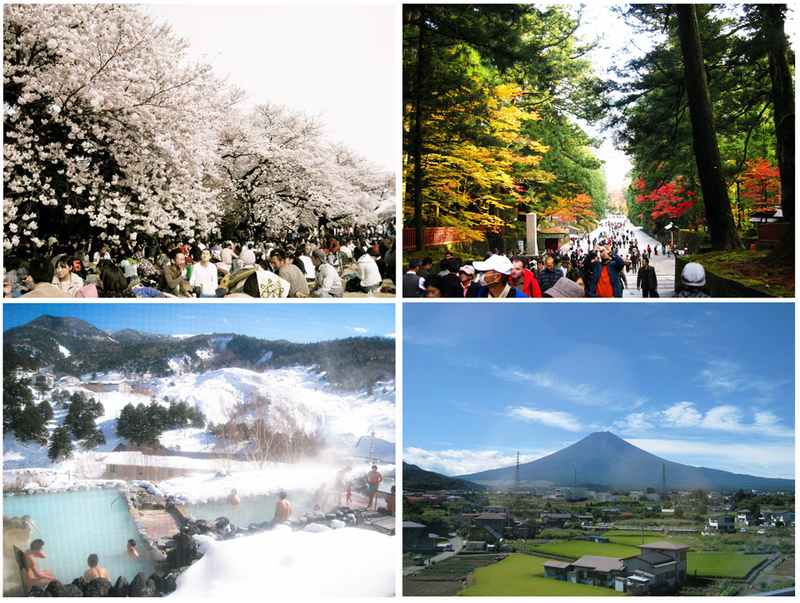 TOKYO – Summer, spring, winter or fall? Due for a Tokyo fix but not sure when to go? As with everything in Japan, it’s all about choices and options, quite often way too many. Just have a look at the beverage section at any Japanese convenience store or the pen/pencil selection at any stationery shop (Ito-ya in Ginza makes my head spin) and you’ll know exactly what I mean. So, when is the best season to go? Well, that depends on the person. Ultimately, everyone is going to have their take on when is best, most likely driven by their own individual interests. Shopaholics might opt for winter and Tokyo’s annual new year sales. Nature lovers might choose springtime when the cherry trees are in bloom; while travelers with kids in tow might find the summer festival season more suitable. Spring (春) - Tokyo in late winter/very early springtime (specifically, from late February to late March) is one of my favorite times to visit and probably one of the most popular. The weather has already started to turn so temps are on the warm side, which is great for sightseeing. If you like to ski or snowboard you can still catch the end of the snow season and be on the slopes in a few short hours. Not to be missed (in early March) is the terrific Media Arts Festival (at the National Art Center), showcasing the best in Japanese anime, entertainment, manga and digital art. Then, in late March, it’s that uniquely Japanese phenomenon…….the blooming of the cherry blossoms, when strolling, boozing, and sampling seasonal foods all beneath the beauty and grandeur of the cherry trees (an activity known as hanami to the locals) becomes the absolute de rigueur activity of the season. Keep in mind the blossoms only last about a week, so timing is key. Popular Tokyo sites for cherry blossom viewing include Shinjuku Park, Aoyama Cemetery (my fave), Hamarikyu (another fave) and Chidorigafuchi near the Imperial Palace (which is probably the loveliest and most popular spot for hanami). Autumn (秋) – To me, autumn is truly one of the loveliest times of the year to be in Tokyo (yes, even more than cherry blossom season). The locals call it kou-you season (pronounced koh-yoh) in reference to the colored leaves, which are some of the boldest and most vibrantly colored I’ve seen (sorry, northeast coast of the US). Kou-you viewing is usually done at parks or temples in the city (look for the maple and gingko trees), and in the surrounding mountains (where the nanakamado shrub seems to come in every autumn color imaginable – greens yellows, oranges and reds). Peak time for kou-you viewing is in mid-October to early December (in Tokyo it’s from mid-November to early December, surrounding areas from mid-October to early November). Best places to view kou-you: Tokyo’s gingko tree-lined Icho Namiki Dori in Aoyama (the fiery yellows are amazing) and the Fuji Five Lakes area (at the base of Mt Fuji), an easy day trip from Tokyo and my favorite place to go for kou-you. Summer (夏) – In summer Tokyo heats up and becomes quite festive, with locals donning their best summer kimonos (aka yukatas) and turning out in droves to attend the many summer festivals (matsuri) and fireworks (hanabi) celebrations, where copious amounts of alcohol and traditional Japanese hawker food (like fried soba noodles, fried octopus balls) are consumed en masse. While the hot and humid weather of summer can make sightseeing a bit of a challenge, the opportunity to experience this fun and very festive aspect of traditional Japanese culture more than makes up for it. Most summer festivals kick-off in mid-July after the rainy season (which begins in June). The highlight is the Sumidagawa Fireworks Festival (on the last Saturday in July), which puts on a spectacular fireworks display over the Sumida River (apparently it’s a competition, so participants try to out do each other). The best way to enjoy the festival is on a dinner cruise along the river, which offers excellent views of the fireworks and some very attractive all you can eat/drink deals. Winter (冬) – Yep, bundle up……wintertime in Tokyo is cold and blustery, and has even been known to get a bit of snow now and then. Still, I love winters in Tokyo. January to early February seems to be the best time to visit. This is when the snow sports season is in full swing, while the city itself has a super festive vibe, all decked out in its Christmas/New Year neon best. During the first week of January, the annual New Year sales all kick-off (think great deals and mega crowds). Most izakayas ( see Tokyo: Izakaya Style) are now serving oden, a yummy must-have winter dish that contains several ingredients (such as boiled eggs, daikon radish, and fish cakes) all stewed in a light, soy-flavoured dashi broth (it’s simple but delish and perfect remedy for the cold weather). Be sure to check out the first sumo tournament of the season (at Tokyo’s Ryōgoku Kokugikan), which is held during the last two weeks in January. Also highly recommended is an overnight stay at a Japanese-style “ryokan” inn in the snow-covered Fuji Five Lakes area (get one with an outdoor onsen). And lastly, although it’s not in Tokyo (rather a short flight away), there is the Sapporo Snow Festival and its world famous ice sculptures, which is held during the first week in Feb.
What’s the little thing that makes Tokyo’s four seasons worth a visit? That each one offers something uniquely awesome to see and do.